Your new CRM system is up and running. But why isn't anyone using it? According to Principal Analyst Bill Band of Forrester, the biggest threat to a successful CRM project implementation is slow user adoption. Band also states that not only is early and pervasive user acceptance one of the biggest indicators of success, it is a MANDATORY precursor to success. But before we dig into this, it’s important to define exactly what we mean by User Adoption . 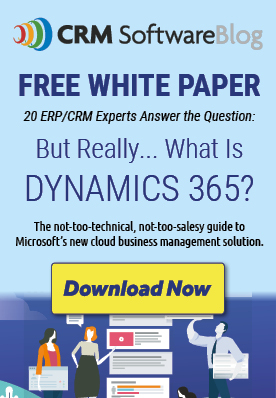 . .
What Happened to Microsoft Dynamics CRM Online? March 29, 2017 · Stoneridge Software · Comments Off on What Happened to Microsoft Dynamics CRM Online? Microsoft gains the upperhand with it’s LinkedIn purchase. December 9, 2016 · Brian Begley, enCloud9 Social/CRM · Comments Off on Microsoft gains the upperhand with it’s LinkedIn purchase. Which is Better, Microsoft Dynamics CRM, or Salesforce?